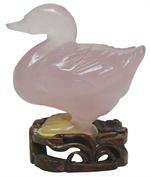 Item #GS-737: 1 1/2"x2 1/4"x 2 1/8" translucent, medium pink Rose Quartz duck on 5/8" wood stand. 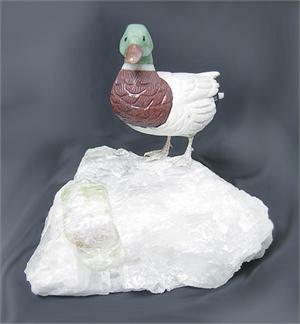 Item #GS-830: 7/8"x2 1/4"x 2" light pink Rose Quartz duck on 2 1/2"x 3"x1" White Albite with Mica and Watermelon Tourmaline base. 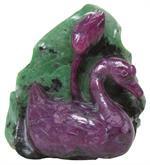 Item #GS-748: 2.5"x1.5"x2.25" opaque, purplish red Ruby duck in green with black Zoisite. 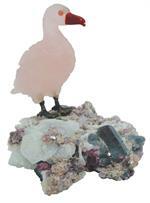 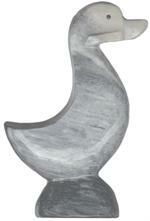 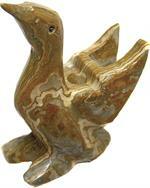 Item #TP-1: Approximately 2.5"x4" tall, assorted natural colors, Mexican Onyx Duck "A" Toothpick Holder.